So I decided that I'm going to make a game (most likely with Clickteam Fusion or Construct 2) and I expect development to take at least five years (probably way more than that). To begin my project, I need to work on art assets. I've put a lot of time and effort into these sprites, but I've gotten very little feedback on how I can improve my work so I made an account here. Any compliments, criticism, suggestions, etc, is highly appreciated. Art looks perfectly fine - that is a whole lot of colours though, and without any context I'm not sure the different faces are distinct enough (depends what they're for really). Thing that worries me most is this long development time, make it easier on yourself! Would using less colours be quicker for you? Maybe dial back the amount of assets needed? Can you distil your vision a bit? I don't think it looks entirely like a cat. The large ears and large eyes makes it sorta bat-like and the most catlike features like the mouth and nose doesn't stand out much. The different faces are so the cat has different expressions. I chose to make the eyes way more expressive than the mouth because it's more characteristic of cats. That, and diverse facial expressions are difficult with mouths drawn that way. I don't think there's too many colors. The black fur has four colors, the white fur has four colors, the ears have three colors, the eyes (excluding the pupil) has three colors, the nose has two colors (same colors as the ears), and the pupil's five colors don't require much effort compared to using a few less colors. I decided early on that I wanted to exaggerate the ears and eyes for my character. The eyes used to be ridiculously huge in older versions of my sprite. Here's what the previous versions looked like. [LINK] [LINK] Needless to say, the sprites have gone through a lot of changes. Without any context I'm not sure the different faces are distinct enough (depends what they're for really). The different faces are so the cat has different expressions. It depends what they're for in context of the gameplay. They are very very similar and not particularly expressive. If this is just an added subtlety that's totally fine, but if it's related to core gameplay or the player should get any information from it, it could use work. You have a lot of almost identical colours, the pupils and the fur definitely don't need different ramps, and pretty sure you'd never notice if I cut the colour count in half. Maybe if you weren't doing 18 colours each frame you'd be less afraid to redraw new expressions than be so templated? Yea, you have way too many colors for such a small piece, dude. And most of the shades don't have enough contrast to tell them apart looking at it at with 100% zoom. Seconded. This sprite could easily look almost identical at 12 colors -- including transparency -- even if you wanted to keep the 'fuzzy' look on the ears/mouth areas, since there is some contrast there. However the black fur and pupil ramps really are just overkill. More than likely you're zoomed waaay in (i.e. more than 700-800%) which is why the colors seem to have contrast to you, but if the subtle transitions cant be gleaned from a quick glance at around, say, 200-400% zoom, you really don't need them since they will just muddy-up the image rather than contribute something valuable to it. With that said, you might as well use photoshop brush tools if you want the fuzzy look and don't care about the number of colors you add. Pixel art is about clarity -- precise placement of dots of colored-light to achieve the maximum clarity in the description of an image you can -- and when you aren't focusing on that clarity by being careless with the most important asset you've got -- your colors -- then you aren't doing pixel art. Regardless of the discussion about what is true pixel art or not, you've probably been staring at these too long while zoomed-in and are likely losing objectivity. It comes with the territory of working at very low resolutions. However, constantly glancing at your preview window, ensuring it has a much smaller zoom% than the area you're working (by at least half), is vital to prevent this sort of illusion when doing pixel art. It will really help in the long run if you're not already doing this. They were intended to be subtle facial expressions changes depending on the character's actions. For example, I'll probably make my character look more menacing when the cats attacks. That drawing is awesome. Did you draw that? I don't feel my past color pallet or new color pallet (see image below) will negatively impact my ability to create facial expressions. 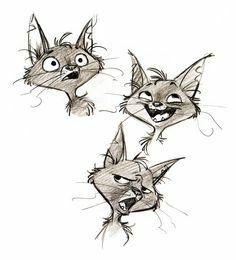 Later on, I'll probably figure out all sorts of ways to make the cat have different expressions. I completely agree, which is why I decided to take your advice and make huge changes to the color pallet. I would've tried to post an update about it sooner, but I was extremely busy yesterday and didn't come home from work today until about three hours ago. I think many of you will feel it's a big improvement over my past color pallet. The only thing I miss about my previous color pallet is that the white shine in the eyes doesn't blend in as much. Oh well. Believe it or not, I frequently zoomed to 100% and 200% throughout the entirety of making my sprites. I liked the soft contrast I previously had, but I agree going with a much higher color contrast and smaller color pallet was needed to improve my sprites. I care a lot about the colors but making this sprite was a huge learning experience. Didn't help that before I created this thread, I was getting hardly any advice from people I know and that this was the first sprite I've made 100% from scratch. 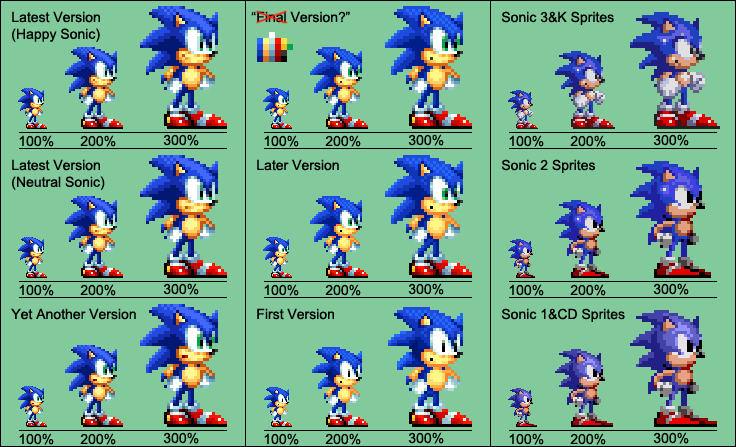 I did make an unfinished Sonic sprite in the past that was mostly from scratch though. I should finish that sprite someday. The only thing I miss about my previous color pallet is that the white shine in the eyes doesn't blend in as much. That's not a problem with your palette -- you can and should *reuse* colors across your sprite to unify it (such as some of the greys in the shadows of the mouth area to create the pupil blend if you really want it. Getting rid of colors isnt equivalent to getting rid of details as long as you have a diverse enough contrast in your color ramps. If you do add the blend back however, I would suggest using only one or two shades at most to blend because that's all you need to express that fade. I took your advice and I think the pupils for the newest version of my sprites turned out pretty well. Outside of adjustments to the pupils, the biggest changes I made to this version are shading adjustments and I reduced the size of the eyes for the neutral expression. Any suggestions you have for my current version of my sprites? In an effort to reduce the color pallet further, I experimented with three shades for the fur instead of four, but I didn't like the results. You can see one of my attempts in the image below.